Safe Seal LLC. Is a Asphalt Sealcoating Company based out of Newark, DE. We are liscensed and instured. 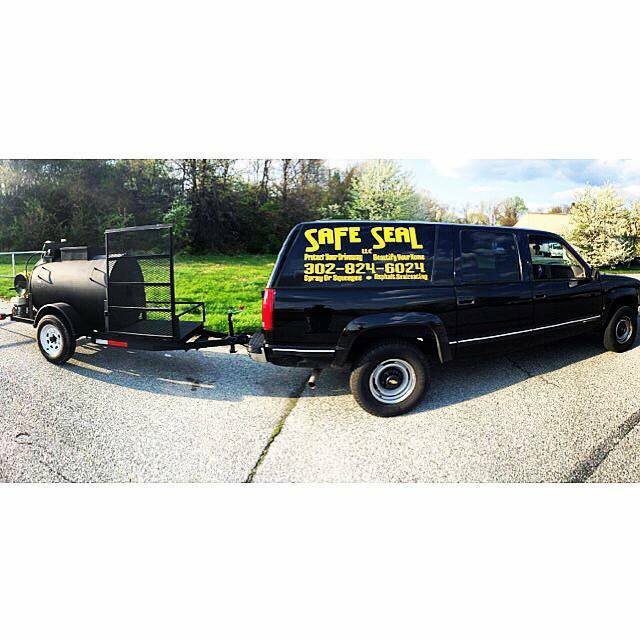 At Safe Seal LLC we bring a professional approach to the local Asphalt Business. We treat every house as if it were our own. We take much pride in the services we provide and only use the best materials. In order to apply our material, we use a custom made sealcoating unit. With this machine, we have full control of how much material is applied to assure proper application. We are one of the only LICENSED and INSURED companies in Delaware that offer both Spray and Squeegee Application methods. We provide 100% satisfaction to our customers. At Safe Seal LLC we believe that there is nothing worse than seeing homeowners spend their hard earned money on a company that splashes material onto their curbs, brickwork, garages, lawns, or anything other than the driveway itself. To prevent this, we use a squeegee, a paint roller, and a paint brush to apply our material around every edge that touches something other than the lawn. In some cases we tape off the edges before using a paint brush. All of our tanks use hydraulic agitation which allows the sealer to be properly mixed and applied. Not only do our tanks have the top of the line mixing mechanisms, they also have upgraded ceramic seals which ensure no leakage to ever happen onto your property. Most companies use rubber seals which are prone to wear and tear. Sealcoating is essential and necessary to prolong the life and integrity of your driveway. Sealcoating provides a weatherproof barrier between your driveway and the elements. Not only does it protect and extend the life of the driveway, but it also provides a beautiful curb appeal. Any cracks need to be addressed as soon as possible. These cracks are a sign of a deteriorating driveway. Cracks allow water and other elements to penetrate the asphalt and sink into the sub base of your driveway. When water gets into the sub base, your asphalt will continue to shift, bubble, and crack unless addressed properly. Fill all cracks. Every crack is cleaned before application. We use a commercial grade hot crack filler which is the same material that is applied to all airports, government buildings, and roads. Clean and sweep driveway using leaf blower, push broom, etc. Apply one coat of coal tar emulsion mixed with water to the manufacturer’s recommendation. Put caution tape at the end of driveway and clean the yard of any trash and/or debris. You do not pay a single dollar until the job is complete. Payment is due within 5 business days of job completion. If you pay with credit or debit, there is a 3% surcharge that will be added at time of payment.